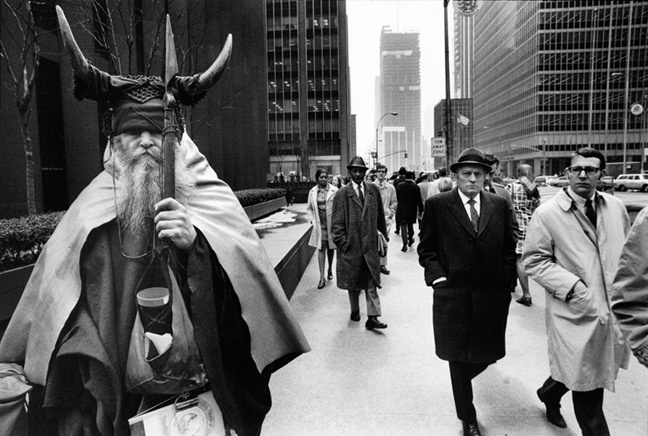 Great photo of Moondog--the man in dark coat and hat could almost pass for Lemmy Caution in "Alphaville." We've all been waiting for a better dead blow-fish song. Next up: Bing Crosby, singing "I'm Dreaming of a Dead Blowfish"
Awww Pablow! What a cute blowfish name. Should have gone with the Ted Cruz endorsement. Friends don't eat friends' friends. Do I hear an echo in here? Pablo needed Phil Spector's Wall Of Sound! I'm wondering what happened to Hootie. Didn't he have a Blowfish too? In the words of Homer Simpson: "Come on, pal. Fugu me!" LL: Ken is Hootie, the rest of us mere blowfish. I saw Miley do a duet with Melanie on Peace Will Come and it was very good. is the new schedule posted somewhere? PLU returns! Joe Frank stays put! O frabjous Wednesday! New sched is not yet "officially" posted. Coming soon. I'm supposed to choose which genre of music I want to listen to first before I can actually hear any music, right? The sickest thing about this mashup is that a former member of King Crimson plays on it. Shoot, for a second there I thought this "Xica" was gonna be another mashup with "Don't Fear the Reaper." I see that Dan Bodah played a Gregorio Paniagua track following a Moondog track on 2/14/14: http://wfmu.org/playlists/shows/54493 This music and RRN63's comment above brought to mind Paniagua and, in particular, his series of Harmonia Mundi recordings recreating early musics. his music makes me so happy. he really was a genius. GWER-See-OH. Also producer of the first 2 Firesign Theatre albums. Yep, that's proto-Glass right there! I'm thinking I've probably heard lots of Moondog and not even known it. This is my favorite Moondog song. :) It makes me think of old cartoons working on a fast-moving assembly line. It's like a better "Powerhouse." Charlie Parker might be on this session; personnel are largely unknown. wow, irwin! love this one! and good call, claw! Oh my God I love this so much. Pastoral- Beautiful as are the other other tracks played. Irwin- I love your Moondog specials- all of them! Oh, nice! This is another favorite. :) Really digging your selections, Irwin! Brilliant show. same here, claw! and yes, irwin! what is the name of the UW musician? maybe I can dig up something about this harp. I still have the 1953 10-inch 'Moondog and His Friends'. Scratchy but it still plays; and the version of 'Theme and Variations' is simply hypnotic. What an excellent program! Thanks, Irwin and Robert! Felt compelled to come back just to post my opinion that this was a BRILLIANT show! An exemplary specimen of everything WFMU can be. Thanks, Irwin, Rbert Scotto, and Moondog. I am getting this program in segments which repeat, which is all very lovely but it's doing my head In! Could you please upload the moondog show as a podcast?! Pretty please with stardust on top?! You're having buffering problems, Wakka, but there's nothing wrong with the archived audio. It's your internet connection. Try again later. We can't release the show as a podcast because it contains copyright-protected music.